A thin soundproofing product for party walls produced from recycled vehicle tyres and designed to help block noise through separating walls in domestic properties. When space is at a premium, the M20AD solution along with 30mm of acoustic plasterboard is the best sound insulation solution for upgrading any wall that only takes up 50mm of space. 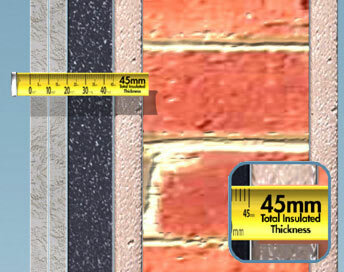 At only 50mm (2 inches) overall thickness, this thinner soundproofing solution is a popular choice of specifiers, installers and home owners when selecting the best solution to soundproof a wall when space is limited. M20AD is a recycled rubber, high density sound blocking and sound absorbing product that is ideal to reduce noise through party walls and is a product that can easily be installed by and DIY competent person or local handyman. 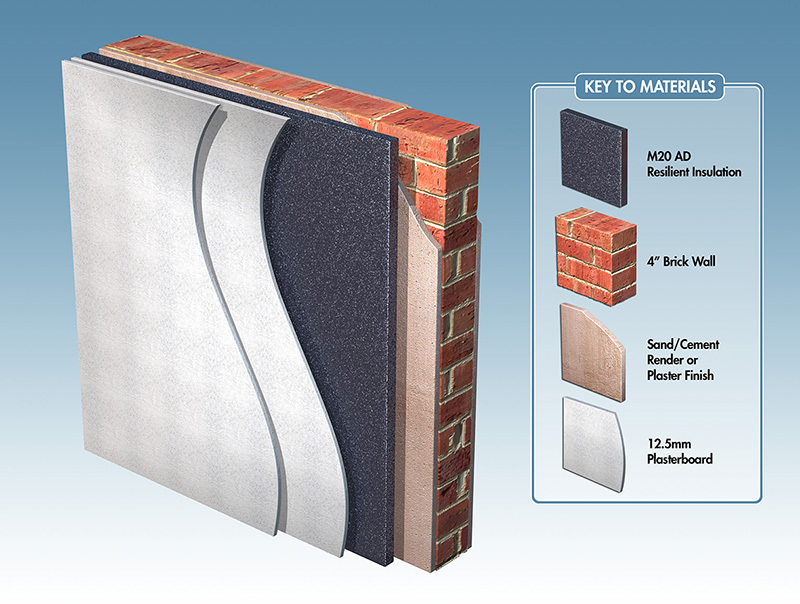 The product is designed to help block and absorb airborne noise through lightweight stud and single skin masonry walls with the minimum increase in the overall thickness of the wall. It is the best and one of the easiest solutions to reduce noise nuisance from neighbours and also to help contain noise generated in your own home. No mechanical fixings are necessary because the product along with two thicknesses of 15mm acoustic plasterboard are bonded using our special sprayable contact adhesive. 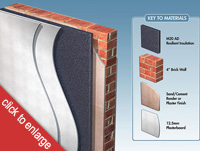 M20AD can also be used to soundproof separating walls from stairs and common areas in flats to help bring them into compliance with Part E for the control of airborne noise through walls. The drawing below shows how M20AD and acoustic plasterboard are applied to a masonry wall which is the same if fitted to a stud wall. When fitted to a single skin masonry wall as shown below, independent testing showed the wall had a sound insulation value of 48dB DnT,W+Ctr which exceeds both the 43dB change of use Part E value and also the 45dB new build requirement. The Technical Specifications link above will take you to further information. Note: Due to the limited thickness of this sound insulation for walls, it will only reduce the intensity of normal noise levels that would not normally be expected to be heard such as the radio or normal speech. Music being played loudly, neighbours shouting or bass noise will always be heard but will no longer be as loud on your side of the wall. Flanking noise around a party wall can also be a problem and should be addressed before upgrading the wall itself. More information on how to do this can be seen in our article Soundproofing Walls. Installation of this system either by DIY or outside help, the product should be installed in accordance with our instructions. For loud noise reduction have a look at our Studio Wall thicker system.